Dental implants are a popular choice for people who have lost teeth, but who might not want dentures. 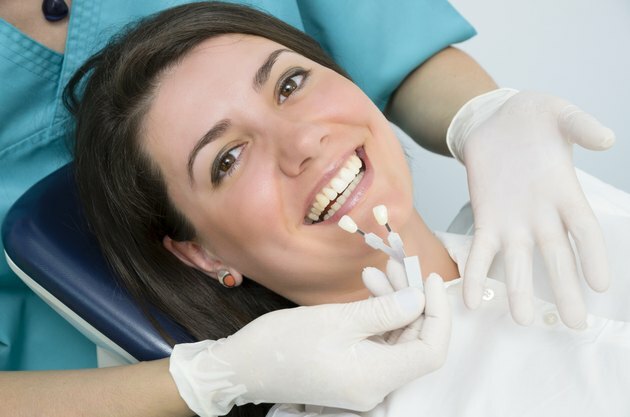 Because these "teeth" are attached to the jaw with surgically implanted posts, implants can improve a person's nutrition as they make eating more comfortable, much in the same way as real teeth. They also improve the aesthetic look of the person and prevent bone loss in the mouth. Despite all of the benefits, there are still dangers of dental implants. According to the Mayo Clinic, one danger of dental implants is a risk of infection, which can develop once the implants are attached to the jaw bone. This is commonly caused by poor dental hygiene in the patient. Not cleaning your teeth and flossing properly after you eat can cause bacteria to build up. Also, people who smoke or use other types of tobacco products are at high risk for developing infection. The American Academy of Periodontology reports that severe infection can cause rejection of the implant altogether. Nerve damage is another danger of dental implants. Damage can be caused by incorrect placement of the implant, resulting in it cutting into a nerve. According to the Mayo Clinic, the nerve damage can progress to numbness in the lips, chin and cheeks. It can also cause discomfort and numbness of your remaining natural teeth. Another risk of having dental implants is complications with the sinuses. According to the Mayo Clinic, this can happen when dental implants that are placed into the upper jaw protrude into the sinus cavity. When this occurs, a person might feel an aching or tingling feeling in their sinuses. Sometimes the sinus cavity will have increased pressure, which can also cause headaches and pain. In severe cases, a person can develop severe migraines from the pain and pressure in the sinuses.